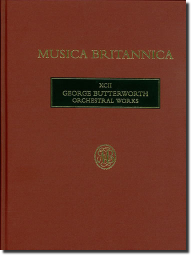 In his brief career George Butterworth (1885–1916) composed only a small quantity of orchestral works, but what he wrote has never subsequently been absent from the repertoire. The two English Idylls, the Rhapsody 'A Shropshire Lad' and the idyll The Banks of Green Willow are, with the music of his friend Ralph Vaughan Williams and of Gustav Holst, among the most exquisite statements of the English folk-song idiom. This complete and authoritative collection includes an earlier version of The Banks of Green Willow, and a fragment of an Orchestral Fantasia. Work in progress in 1914 when Butterworth enlisted to serve in the Great War, it suggests the composer setting out in a bolder direction, perhaps inspired by the example of Vaughan Williams's A London Symphony. Performing material is in preparation.